COVER BOTH ENDS of your liquid-cooled R/RS for 15% less. Select from 3 options below. The Avant R/RS front engine guard and MudSling™ rear suspension guard Double Bundle for the R1200 R/RS_LC are a matched set designed to protect vulnerable surrounding surfaces from stone abrasion, tar, and mud accumulation. If you plan to install LED driving lights from BMW, Clearwater or other brands, order the Avant R/RS and Light Bar Bundle, or the Triple Bundle which includes all three products - Avant R/RS, MudSling, and Light Bars to increase your savings. 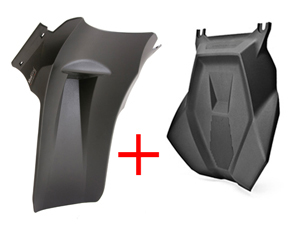 Avant R/RS is a new kind of front end guard for the R1200 R/RS designed to shield the painted engine, exhaust headers and surrounding surfaces from stone and splash abrasion damage over time. Avant R/RS mounts to the engine/chassis behind the front fender. It covers the full height of the engine, 12.5" (325mm), mounting to two existing screws at the top, and to the bottom of the engine case via an aluminum bracket and M8 bolts. At its widest point, 11.5" (295mm) it partially overlaps the exhaust headers to reduce stone abrasion and leaves sufficient clearance for cooling airflow. MudSling’s™ effective coverage area is 8.5" wide x 16", protecting the Paralever arm, rear shock absorber, and electronics module, while reducing splash out to the sides onto riders' legs. MudSling provides broad area coverage while looking slender from the side and is well integrated with the R/RS bikes' styling. MaMo Light Bars enable fitting the Avant R/RS engine protection shield to the R1200 R/RS together with LED driving lights, either those from BMW or aftermarket brands such as Clearwater, whose Darla model is shown here. MaMo Light Bars are individual left and right sides finished in satin black powder coated steel and mount in the same location as BMW's bar. They enable both the benefit of improved LED driving light illumination and the protective benefit of the Avant R/RS. Mounting hardware is included.